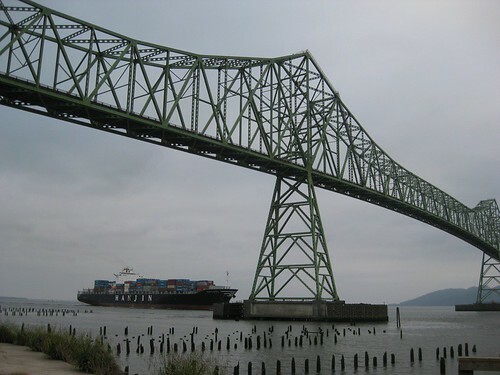 Astoria - Crochet, Starbucks and roadtrips, oh my! Cory, Linus and I went to Astoria last weekend! On Saturday morning Cory slept in while I hung out downstairs, crocheting furiously because I made a mistake on the sleeves of my Tunisian jacket sample and had to redo them. We left around 11, after packing and all that good stuff. 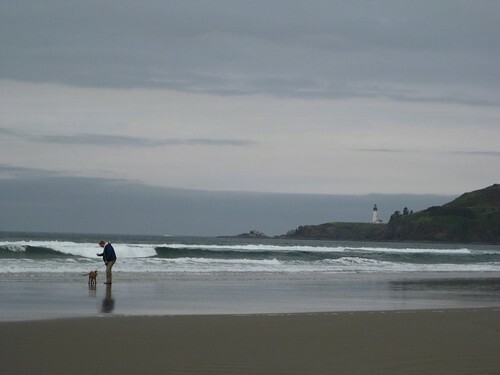 We drove west to Newport, and stopped at Agate Beach to introduce Linus to the coast. It had rained overnight, so the sand had a "crust" over the top of it, so it wasn't soft unless you broke through a little. Linus liked it anyway. He danced around, and when we got to the surf he tried to chase the bubbles at the edge of the waves. After a little while we dusted the sand off ourselves and headed north on 101. We stopped here and there for lunch and for Linus to go potty and also for a little playtime. We went to the Tillamook cheese factory but there were so many people there that we left pretty quickly. Rockaway Beach was really nice; we'd like to go back again in the summertime and earlier in the day when all the colorful shops are open. Finally we reached Astoria, at around 7pm. 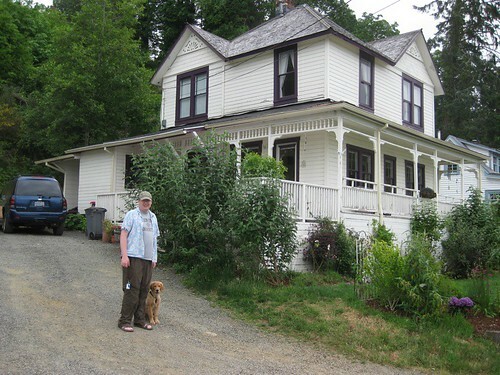 We went straight to our hotel, which was in our "Canine Oregon" book, the Lamplighter Motel. And it was awful. Paint was cracked and peeling, there were baseboard heaters and a box fan for temperature control, there was mold in the shower around the window... so we went out again so we didn't have to be there. We drove up an insanely steep hill as we explored, and made our way to the Astoria Column. (Here is one view of it; our camera was full by the time we got up there so we used iPhones which aren't nearly as good as this pic. But the real view is FROM it - you can see all of Astoria, the Columbia River, and the ocean too.) Then we took a roundabout way back down the hill and found a Rogue pub! So we went there and had onion rings and beer to pass the time. Finally it was starting to get dark and we were tired and Linus was exhausted, so we went back to the motel. We let Linus up on the bed, but he was so tired that he fell asleep within a minute without even really enjoying the fact that he was on the bed. Poor guy. We watched a little bit of Princess Bride and then fell asleep ourselves. During the night someone banged on our door and a lady outside yelled to the banger "THAT'S NOT OUR ROOM!" Then at 4:30 Linus was tossing and turning so I took him out to go potty. And then at 7:30 Linus and I were up for the day. I took him out by myself for a little bit, and then came back and got showered (where I stood in the exact middle of the little suction-cup-traction-mat-thingy, ack) and re-packed. When Cory got up we went for a walk on the riverfront. That turned out to be a good idea, as a barge was about to go under the Astoria bridge, right by where we were walking. A Best Western hotel was next to the bridge, and we had fun watching all the people come to their windows and outside to see the barge go by. Next we piled back into the car (Linus was getting to the point where he'd rather not get in the car anymore; after awhile we'd approach the car and he'd try to walk away from it. Heh) and drove south a bit to Fort Stevens. The fort was built in 1963 to protect the mouth of the Columbia against an attack by the British during the Civil War, which never happened. The fort was eventually put on the surplus list in 1047. I remember going there as a kid, once, and being pretty scared of it as there are a lot of dark buildings built into hillsides. Ominous to an 8-year-old. But this time we had fun. They were even doing little cannon demonstrations up at the main museum area so we watched them do that before we headed out. ...and then we were on our way. We went east on highway 30, and once in Portland we stopped to pick Haley up and then stopped at Dad's house so that we could all spend the afternoon together. After dinner at Berlin Inn, we came home. It was nice to be back in our own beds even though we'd only been gone one night! I got to hit up the Cannon Beach Pig 'n Pancake location on New Year's Day. They definitely have authentic pancakes.